4-Ingredient, Air Fryer Zucchini Chips - And A GIVEAWAY! A couple months ago, my husband and I complexly changed our eating habits and committed to living a healthier life style. Since then I have had a lot of fun experimenting with food and trying to recreate healthier versions of recipes we used to eat. 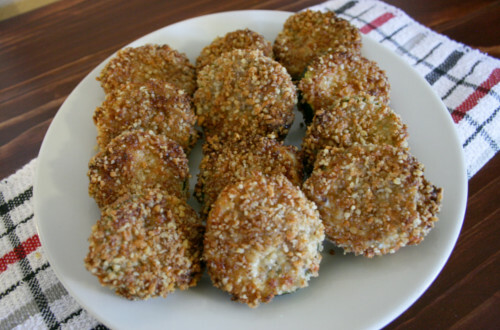 One recipe that I have successfully recreated is fried zucchini chips. I'm telling you, these zucchini chips are so good that you will not believe that they are actually healthy. The best part is, they only use 4 ingredients and are super simple to whip up. The trick to these zucchini chips is my new Simple Living Products 5.2L Manual XL Air Fryer (model number SL-AFM-5L). Scroll to the bottom of this post for a chance to win your own Simple Living Products 5.2L Manual XL Air Fryer!!! 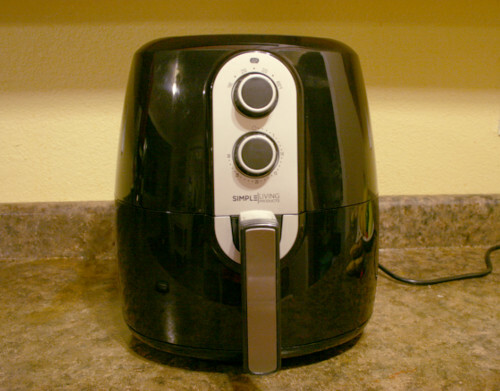 I received the Air Fryer a couple days ago from Simple Living Products and I have used it almost every day since then. Before receiving it, I had no idea how much I needed one. Even after receiving it, I didn't think it would get used that much. Boy was I wrong. I have made everything from vegetable dishes, sweet potatoes, and even chicken. While going through my recipe book that was included with the air fryer, I came across a recipe for Parmesan zucchini fries. I love breaded zucchini but it's been a while since I had any so I was excited to try the recipe out. Unfortunately, aside from the Parmesan and the zucchini, I didn't have any of the other ingredients. Not wanting to go to the store, I decided to experiment with a few items I had on hand and the results were amazing. Start with half a cup each of walnuts, Parmesan cheese, and yogurt. And one large (or two small) zucchini. Mix the Parmesan cheese and walnuts together in a blender or food processor. Dip each zucchini slice into the yogurt and then into the walnut & Parmesan mixture. Once your air fryer is preheated, place the zucchini chips in a single layer in the air fryer basket and set the timer for 16 minutes. After 8 minutes use a pair of tongs to carefully flip the zucchini chips over. Once the zucchini chips are a golden brown remove them from the air fryer and let cool. The air fryer turns the breading into a beautiful golden brown. The outside breading will turn crispy while the zucchini inside will be soft and juicy. 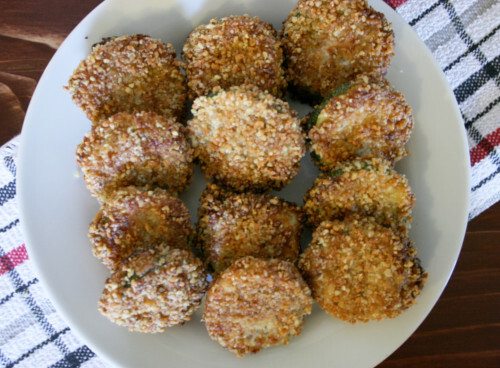 These are the perfect afternoon snack or they would make a great side dish. Cut the zucchini into 1/4 inch slices. 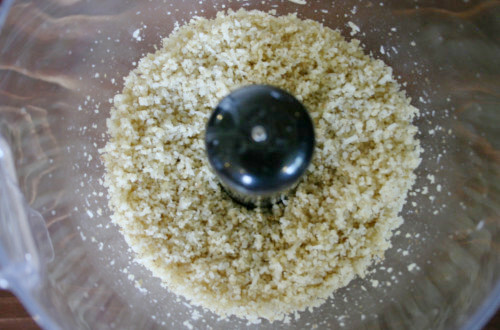 Place the Parmesan cheese and walnuts in a blender or food grinder and blend until well mixed. 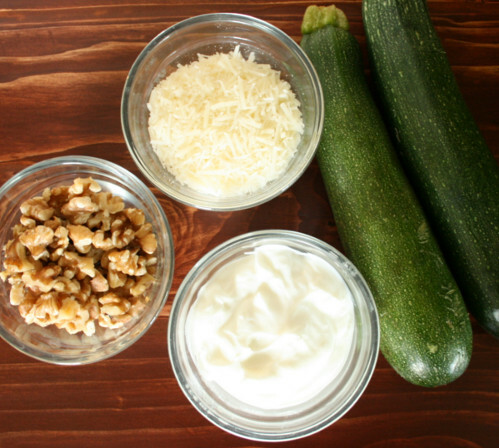 Dip the zucchini slices into the Greek yogurt and then into the cheese and walnut mixture. Set the Air Fryer to 360 degrees and let it preheat. 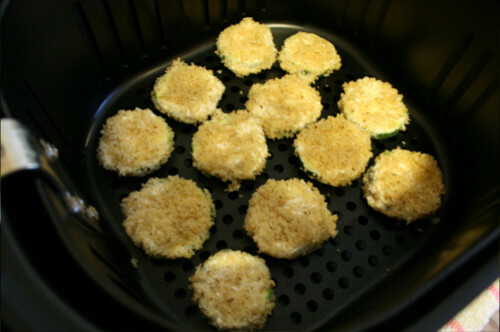 Once the Air Fryer is preheated, place the zucchini chips in the air fryer basket in a single layer and set the timer for 16 minutes. After 8 minutes use a pair of tongs to carefully flip the zucchini chips over. This Air Fryer is Amazing! 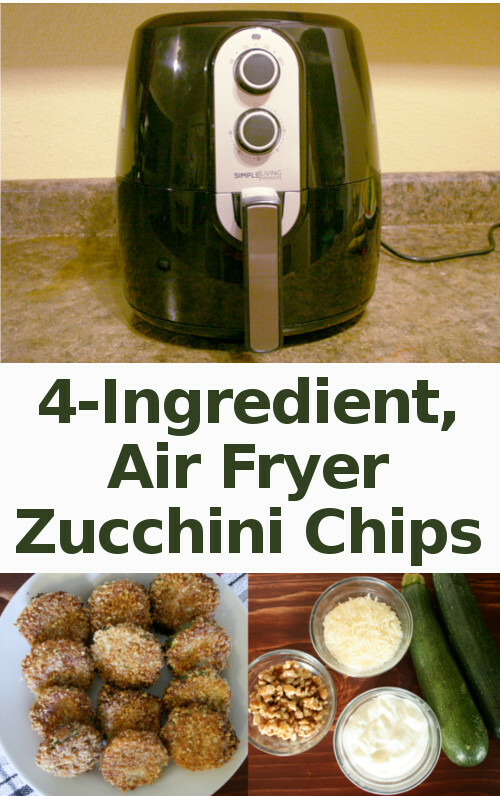 While there are many advantages to cooking with an Air Fryer, here are a few of my favorites. Being able to eat fried foods that are actually healthy. I've been experimenting with different types of breading and replacing many of our dishes with healthier options. The Air Fryer makes it so much easier to eat meals that we enjoy while still living a healthy lifestyle. Freeing up my oven. When my husband and I started eating healthier, we started baking most of our food instead of frying it. Trying to cook chicken, sweet potatoes, and veggies in the oven at the same time usually ended up in one or two items being either over cooked or under cooked. Using the air fryer allows more options so that I can cook what I need to at the temperature that it needs to be cooked. The included divider. The Simple Living Products 5.2L Manual XL Air Fryer comes with a divider that slides into the pan allowing you to cook more that one item while keeping them separate. Sometimes my family can't always agree on the same vegetable or side dish. Usually i'm a "If I cook it, you better eat it" type of mom. But some days I just don't really feel like dealing with the struggle. The divider allows me to cook two separate side dishes in the same pan, making everyone happy. Clean up is so easy! The non-stick surface wipes clean with a paper towel. I usually just rinse it with soapy water then apply a thin layer of coconut oil to preserve the non-stick surface. It literally takes seconds to clean! If you wish to purchase your own Air Fryer I would highly recommend the Simple Living Products 5.2L Manual XL Air Fryer. The large size allows for so many more cooking options compared to smaller versions I've seen. The Air Fryer comes with a cook book that includes recipes such as vegetable egg rolls, chicken fajitas, and even pizza. Yes, that's right! You can cook pizza in your Air Fryer. Also, as mentioned above, the divider is perfect for cooking more than one item at a time without adding more dishes to your cleaning routine. This Air Fryer is definitely a product I would recommend for anyone wishing to live a healthier lifestyle. Want your own Simple Living Products 5.2L Manual XL Air Fryer? Ok, now on to the best part!! Simple Living Products is giving away 3 Healthy Cooking 5.2L Manual XL Air Fryers. Sign up now for your chance to win!! Do you already own an air fryer? What is your favorite thing to cook in yours? Please share your favorite recipes in the comments below. That’s a great overview! Thank you for providing it! And this zucchini chips looks amazingly good!